Still don't know what to do with the empty cereal boxes that keep piling up in your recycling? My advise is to get some pretty wrapping paper an make some handy storage boxes. I finely took the first step and got a beautiful black&white paper and moved on to my favorite projects - recycled craft. I say, it's time for a little cosmetic surgery! 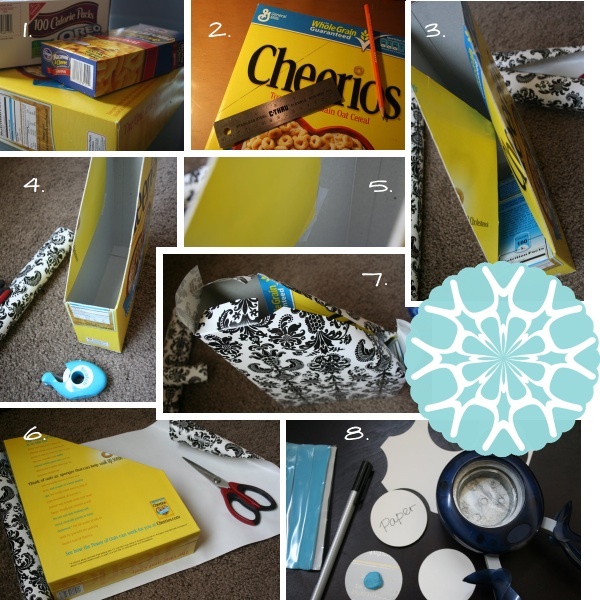 I always feel bad about throwing sturdy cereal boxes away... the material is just too good, especially the cheerios box (my favorite breakfast, when eggs & bacon are out, hehe) that is just too perfect for a magazine box. For the white circle tags I used a piece of leftover cardboard, black ink-pen and blue mounting putty to attached it to the box - easier to switch the tags if u want to change the content of the box.